MYOB Accounting software is powerful, yet easy-to-use business software, and is applicable for any kind of business. 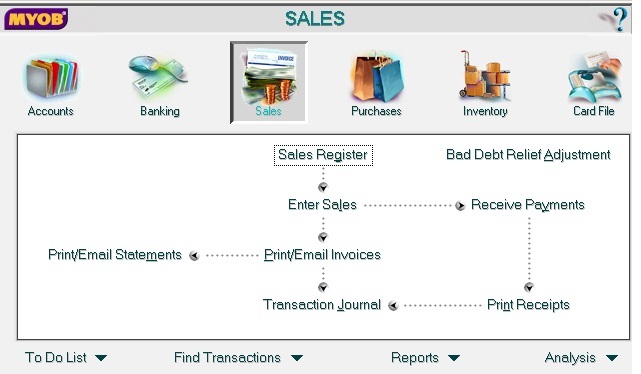 This business accounting software will help you process sales and purchases, track receivables, payables and GST. You can email your quotes, and invoices. 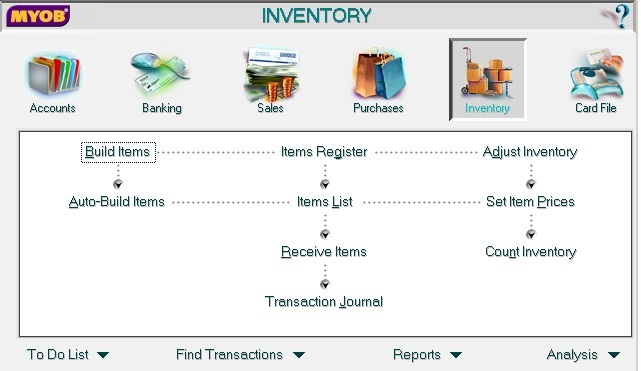 With MYOB Accounting's powerful inventory management system, you will know exactly what is in stock, on order and committed. Use MYOB Accounting system to manage your cash receipts and expenditures, manage your stock, goods or inventory, and generate the accounting reports for management and financial reporting purposes. Get real time data, anytime. MYOB accounting products have been developed and sold in Australia since 1990, and distributed in Malaysia since 1996. Need help with setting up MYOB Accounting system? The Easy Setup Assistant is a series of questions that will help you setup your accounts according to your industry and business needs. Receive warning if duplicate Cheque No. After you have recorded the Sales Invoice, you can click the Print Invoice button to print the invoice which you can then send to your customer. Better still, save on postage and stationery costs by emailing the invoice straight to your customer so they receive them faster, and you will get paid faster. Every business is unique, and your business forms should portray your business uniqueness. Redesign completely the MYOB invoice, statements and other forms to suit your business needs. Make them your own. You can customise a wide range of data fields, borders, background pictures, shading or coloured lines. Want to add a logo, or a customised text? Want to add header and subtotal lines? 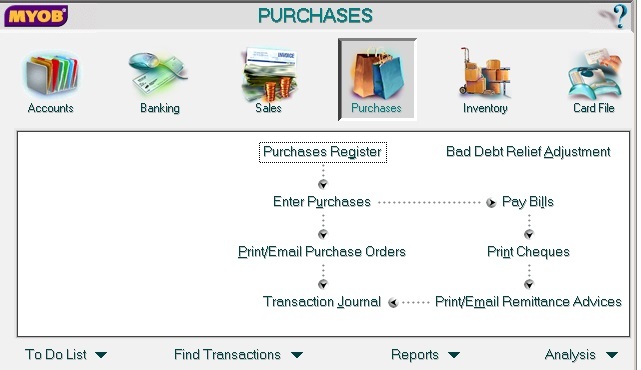 The MYOB form designer makes it possible. Turn your MYOB software into a cheque writer. You can customise the printed cheque so they fit the fields on the cheques you use. 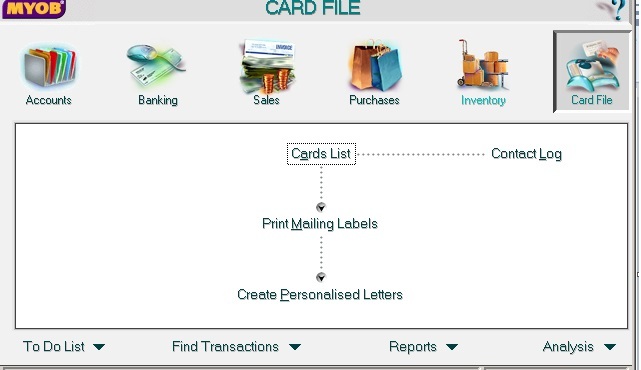 Then, insert the cheque in the printer, and let MYOB Accounting print the payment details onto your cheque. Just this function alone could save you money. You have achieved 2 tasks with one action; You have written your cheque, and at the same time updated your accounting software with the record of payment. Reconciling your bank balance with the bank statement is an important accounting task. 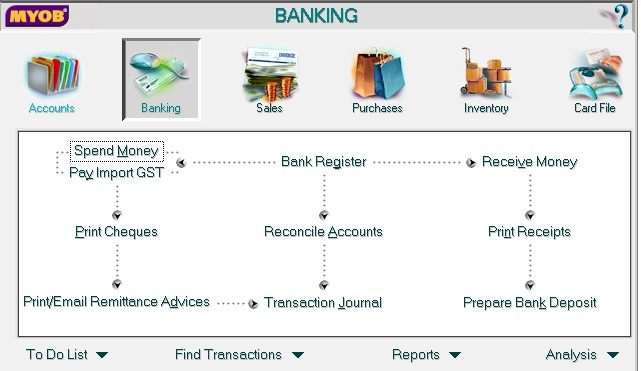 The process of bank reconciliation process can be a long and tedious task. Click Reconcile Accounts button to begin the process of reconciling your bank book. Enter your bank statement balance and tick off the cheques and deposits that have cleared. MYOB Accounting system will tell you if you’re out of balance. If you need to make an adjustment for bank charges and other transactions, you can do it within the Bank Reconciliation window itself. There are several repetitive transactions that you need to record, on a daily, weekly, monthly, quarterly, or yearly basis. You can create a template for such recurring transactions. You will be reminded to record the transaction before its due. 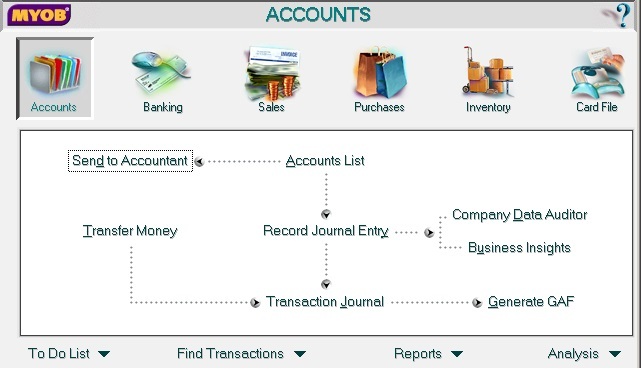 MYOB system does not require the user to have any accounting experience to use the system. MYOB Accounting system takes care of the double-entry accounting entries for you. It will post the transactions to the relevant accounts, and will generate the Trail balance, Balance Sheet and Income Statement automatically for you. The Business Insights feature allows you to analyse key financial information, and provides current information about profits, turnover, and operating expenses between financial periods.